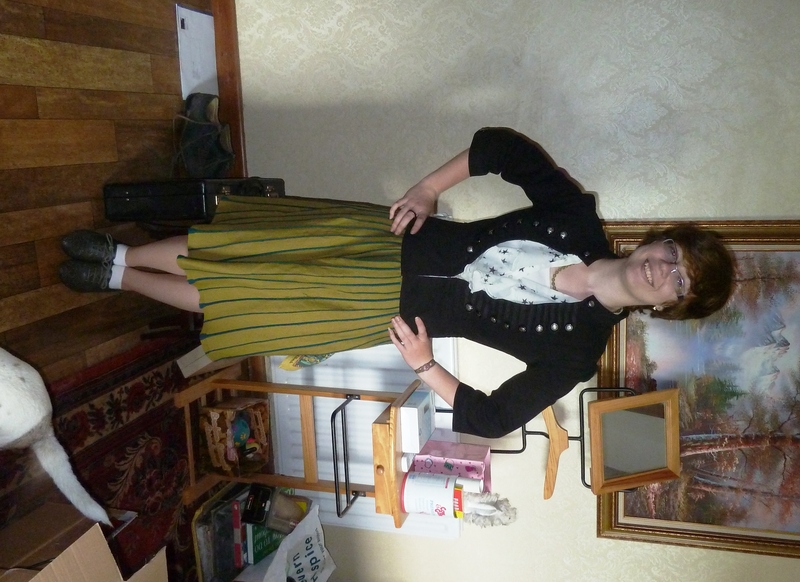 I hadn’t realised how long it had been since I had posted outfit photos! This one dates back to March and follows my trip to H&M’s sale 😛 Dark purple skinny trousers – they are not denim exactly, maybe more like chinos…but I wanted some non-jeans trousers and these were really pretty! They were slightly skinnier than I expected, but actually surprisingly comfy 🙂 The yellow/ochre top is an oversized crop t-shirt – lovely for dancing, and the colour is amazing. The scarf is an infinity scarf, i.e. no ends. It’s really soft and fluffy…but quite bulky with a coat or jacket. I was going to post another outfit, but for some reason it won’t let me rotate it properly Oh well! This outfit, despite the bad lighting, shows a dress that is one of my sewing alteration projects. I loved the colour of the fabric, and it was £1, but it was a size 18. Being one-shouldered, it was a tad too big for me! 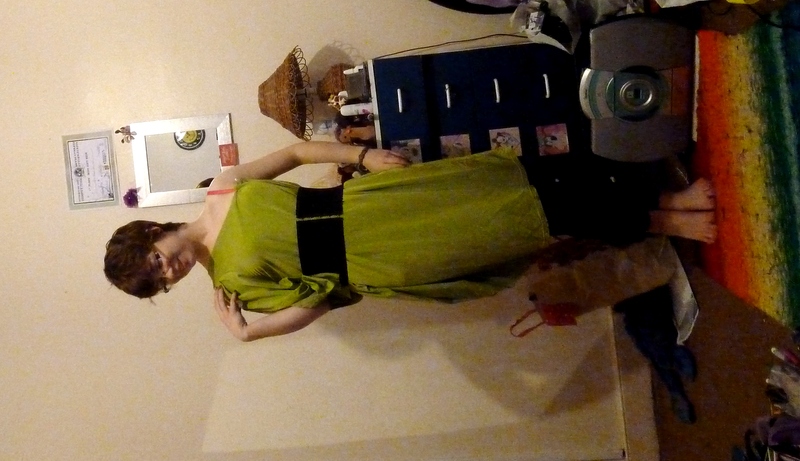 However, a bunch of safety pins and a belt later…and I have a green dress which fits me! I will eventually get round to sewing it to fit – it needs pleat folding rather than scrunching – but I could wear it if needed. Lastly, an outfit I wore a couple of weeks ago to go shopping with my Grandparents. I’ve been trying to dress more classically recently, but still having an element of my personality. I think knee length skirts with blouses look really elegant, and it’s a shame that more people don’t wear them. The skirt is one from the last clothes swap I did, the blouse and t-shirt are charity shopped, and the jacket is from the Primark sales of two years ago.